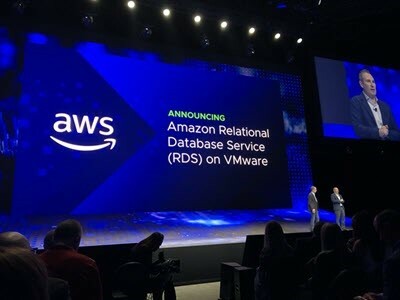 Amazon Web Services (AWS) and VMware have made another joint announcement at VMworld 2018, revealing plans for the upcoming launch of Amazon Relational Database Service (RDS) on VMware. This announcement was med by VMware CEO Pat Gelsinger on stage during the day one keynote and as per AWS chief Andy Jassy d this announcement was a good example of where the companies are continuing to deepen their partnership. This new offering will bring all the capabilities of RDS to VMware customers and it will allow customers to do the same on-premises or on the AWS public cloud. Amazon RDS on VMware is a service that will make it easy for customers to set up, operate, and scale databases in VMware-based software-defined datacentres and hybrid environments and migrate them to AWS or VMware Cloud on AWS. Also in coming months Amazon RDS on VMware will support Microsoft SQL Server, Oracle, PostgreSQL, MySQL, and MariaDB databases. As you aware that we have to spend more time to provisioning hardware, installing and patching operating systems and databases, and managing backups. For many years, Amazon Relational Database Service (RDS) has taken care of this all activities and simplified the use of MariaDB, Microsoft SQL Server, MySQL, Oracle, and PostgreSQL in the cloud. AWS customers love the high availability, scalability, durability, and management simplicity of RDS. You will be able to provision new on-premises database instances in minutes with a couple of clicks, make backups to on-premises or cloud-based storage, and to establish read replicas running on-premises or in the AWS cloud. Amazon RDS on vSphere will take care of OS and database patching, and will let you migrate your on-premises databases to AWS with a single click. VMware vSphere environment is a effective private local AWS Availability Zone (AZ), connected to AWS across a VPN tunnel running over the Internet or an AWS Direct Connect connection. And you will be able to create Multi-AZ instances of RDS that span vSphere clusters. Backups can make use of on-premises storage or AWS with respective retention policies. Backups are portable and easy to create an in-cloud Amazon RDS instance. Point in Time Recovery (PITR) will be supported, as long as you restore to the same environment. You will be able to manage your Amazon RDS on vSphere instances from the Amazon RDS Console and from vCenter. Also you can use the Amazon RDS CLI and the Amazon RDS APIs. Initially launching in the US East (N. Virginia), US West (Oregon), Asia Pacific (Tokyo), and Europe (Frankfurt) Regions and in future this will be available in more regions. Register for the Preview and try Amazon RDS on VMware.